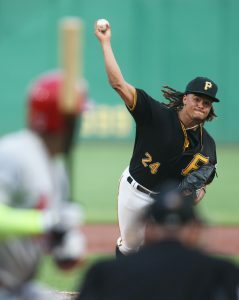 Although towering right-hander Tyler Glasnow has gotten off to a slow start this year, the Pirates aren’t considering demoting the starter to Triple-A, writes Rob Biertempfel of the Pittsburgh Tribune-Review. While Clint Hurdle told Biertempfel that Glasnow must earn the right to stay in the majors, the manager is “a firm believer, as I believe everybody else is, that the greatest opportunity for growth is for him to pitch at this level and meet the challenges of the game at this level — and to understand the consequences of not being able to do the things you need to do at this level. You feel a lot more here than you do at Triple-A. There are games in the minors that nobody knows about. You don’t care. Up here, there’s a different care.” Glasnow had control problems in the minors last season, but the star prospect nevertheless dominated at Triple-A. The majors have been less forgiving for the 23-year-old, whose control issues haven’t dissipated since he debuted last season. So far this year, Glasnow has allowed nine earned runs on 10 hits and seven walks in 6 2/3 innings (two starts). Cardinals brass spent the offseason preaching defense, but Jose de Jesus Ortiz of the St. Louis Post-Dispatch wonders where the improvements are. The Redbirds rank among the majors’ bottom five in both errors (10) and Defensive Runs Saved (minus-14), and, in Ortiz’s estimation, have relied far too heavily on Matt Adams in left field (FanGraphs’ Dave Cameron echoed a similar sentiment Friday). Adams slimmed down during the winter, but he still entered the season as a first baseman with no outfield experience, which has been obvious to those who have watched the Cardinals in the early going. Nationals shortstop Trea Turner, on the shelf since suffering a hamstring injury April 8, doesn’t expect his stay on the disabled list to last beyond the 10-day mark, per Jamal Collier of MLB.com. Turner could return as early as Wednesday, though that will depend on how he fares while testing out his hamstring before then. The speedster showed progress when he ran sprints, took batting practice and fielded grounders prior to the Nats’ game against the Phillies on Sunday. He’s one of two Washington shortstops dealing with hamstring injuries – Stephen Drew is the other – which has left the position in the hands of Wilmer Difo. The Rays believe there are roughly eight teams with strong enough farm systems to put together a package for right-hander Chris Archer in advance of the Aug. 1 non-waiver trade deadline, reports FOX Sports’ Ken Rosenthal (video link). One of those clubs, the Pirates, would have to move both righty Tyler Glasnow and outfield prospect Austin Meadows to acquire Archer. Glasnow, who’s currently in the midst of his second major league start, is sixth on Baseball America’s Midseason Top 100, while Meadows is 10th. Tampa Bay’s asking price is quite high, then, but Rosenthal notes that Archer has an eminently team-friendly contract through 2021. The soon-to-be 28-year-old has struggled to prevent runs this season and has seen both his walk and home run rates increase significantly, but he was a top-of-the-rotation option over 535 1/3 innings from 2013-15. The remainder of the Royals’ current homestand (five games) will determine their course entering the deadline. At 48-47, the reigning World Series champions are eight games behind AL Central-leading Cleveland and five out of a Wild Card spot. Should they end up selling, free agents-to-be Edinson Volquez, Luke Hochevar and Kendrys Morales are all candidates to change uniforms. So is closer Wade Davis, whose contract expires after next season and whose demand around the league will only rise if the Yankees retain their late-inning relief aces. FanRag Sports’ Jon Heyman reported earlier Saturday that Washington is among the teams interested in Davis. Nationals right-handed pitching prospect Erick Fedde could headline a package for Yankees closer Aroldis Chapman, and Rosenthal says landing the 23-year-old would be “a coup” for a team that covets young starters. 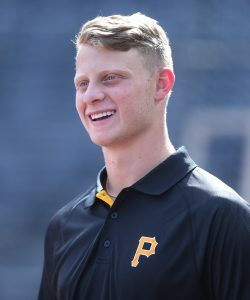 Fedde, the 18th overall pick in the 2014 draft, is BA’s 61st-ranked prospect and has put up a 0.69 ERA in his last eight starts at the High-A level, per Rosenthal. The thinness of the pitching market means it would make sense for the rebuilding Reds to listen to offers for righty Anthony DeSclafani, according to Rosenthal, who adds that the timing might not be right for Cincinnati to deal him. Given that DeSclafani is under club control through the end of the 2020 season, the Reds could build around him or keep him for now and hope his trade value continues increasing. The 26-year-old has been stellar this season, notching a 2.50 ERA, 7.15 K/9 and 1.61 BB/9 in 50 1/3 innings.